For the past 30-plus years, Gary Vigen has taught art classes to junior high students in Colorado Springs. He has instructed quite a lucky group of teenagers over the years. Vigen is a master at the art of painting on glass. Taking courses from a gentleman who has spent over three decades honing his craft as both an artist and as an instructor is not a privilege afforded to every junior high student. As with every teacher, Vigen’s work as an educator can go undervalued. However, his work outside of the classroom, as an artist, is definitely appreciated. 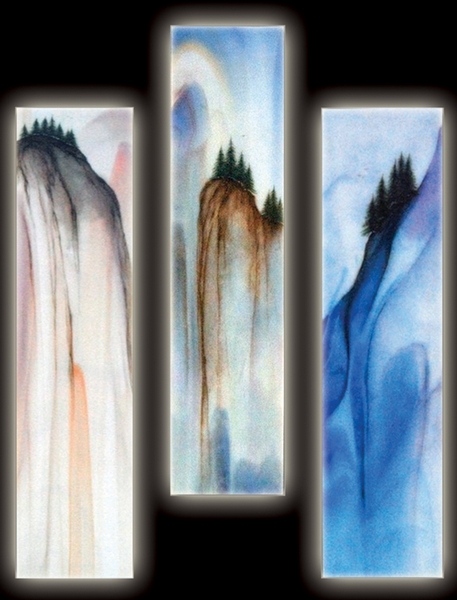 With over 4,000 original paintings on glass purchased throughout the world over the course of Vigen’s career, the appreciation for his creative contribution to the world spans far and wide. Vigen was drawn to his works on glass through his love for drawing. In seeking a way to enhance his drawings, Vigen was lured by the luster of hand-rolled glass. His technique is extremely unique, yet is found in artwork that dates back for centuries. Vigen’s subjects in his hand-rolled glass paintings are just much more contemporary than the paintings on glass found in historic buildings throughout the world. If you have been to any cathedral, you have surely admired the large stained glass windows. Many of these are done in the same fashion that Vigen works. While ancient, the technique of painting on glass saw a significant decline in its use over the course of the 19th and 20th centuries and is just now experiencing a resurgence. Working in a manner similar to past masters, Vigen begins each painting by going on a pilgrimage. Every piece begins with the careful selection of a piece of hand-rolled Uroboros glass. The best pieces are often found in Oregon, and Vigen is no stranger to travelling to the Pacific Northwest in order to find the perfect base for his painting. While looking for a special piece of glass, Vigen pays attention to the grain and character found in each slab. The lines in his work often conform to those found naturally in the glass Vigen selected. The colors are always pulled out of the glass through the final part of his process, firing the finished painting in a kiln at temperatures close to 1,300 degrees Fahrenheit. Much of Vigen’s work depicts landscapes he developed based on the mood of the glass. According to Vigen, every painted landscape he creates, “has its own unique characteristics to entice the viewer to remember or see a special time or place in nature.” Vigen’s palette consists of a wide variety of colors. Each color used in the painting consists of a hand-mixed, oil-based powder paint. The materials found in Vigen’s paints are exactly the same as the minerals used to make the uroboros glass that he paints on. Vigen applies his paints to the glass in any number of methods – anything from the use of brushes, to sponges to pens. He will apply several layers of paints to strengthen the depth and intensity of the color. Lastly, Vigen fires the piece to bake the paint right into the glass. While Vigen’s landscapes come from the imagination, they are often focused on parts of the beautiful state of Colorado. His style lends itself perfectly to the creation of fictional waterfalls, canyons, meadows and mountains. Each landscape focuses on a small grove of trees or one incredibly resilient tree. Painted on Vigen’s glass, the strength of the forest or the singular tree is evident in its rich textures and bold colors. The light in each painting is enhanced by the colors found in the glass Vigen paints on, giving each piece the distinct feeling of a time of day and year. In addition to the trees Vigen paints, every landscape he creates has a tiny bird or flock of birds fluttering through the painting. Hardly visible, yet always there, the birds combine with the lines of the landscape to create a strong sense of movement. A real bird aficionado, Vigen also has a series of paintings on glass that capture the unique personalities of each feathery character. Often serious, and frequently whimsical, Vigen’s bird paintings offer a playful side to his work. As always, they are founded in his love for drawing. And hey, every teacher needs to let loose every once in a while! Vigen will be in the Art on a Whim gallery in Breckenridge today through Sunday and next Friday and Saturday. Being the teacher that he is, Vigen will be demonstrating his craft and answering questions about the ancient technique of painting on glass. In addition, Vigen’s newest works on glass will be on display throughout the gallery.